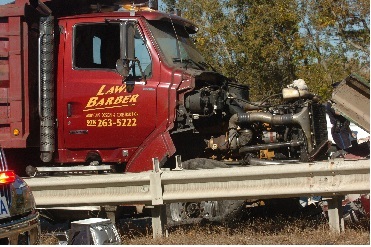 October 13, 2006, the defendant driver was driving a dump truck weighing 68,000 pounds. The truck was traveling east exiting the rotary, in Concord, Massachusetts. After the Route 2 light turned red and the traffic slowed, he swerved from the right lane to the middle lane at a high rate of speed and ran through the red light. Cars traveling north and south traveled through the green light. The plaintiff’s decedent, a 52 year old woman who had lived in Concord most of her life, was the second vehicle traveling north through the greed light when the speeding dump truck struck her driver’s door, immediately killing our client’s wife. Notwithstanding the clear evidence of negligence, the district attorney’s office prosecuting the driver in criminal court, and the Commonwealth of Massachusetts finding the company that leased the vehicle guilty of several violations, Commerce Insurance Company refused to make any offer of settlement. Caring greatly for our client, we attended each and every criminal hearing of the defendant, even though the district attorney had competent counsel. Using aggressive “discovery,” we determined that the defendant driver had an extensive driving history for speeding, marked lanes, and red light violations. In this case, he was convicted of speeding, marked lanes, red light violation and wrongful death and was sentenced to 18 months in the Middlesex House of Corrections. The plaintiff was prepared to prove that the owner of the truck and the employer of the driver were negligent in hiring and retaining the defendant: they “knew” his driving his driving history, yet allowed him to drive their trucks. We refused to settle with the insurance company until the defendants produced monies of their own to supplement the insurance company’s offer, proving that two years of relentless representation was effective. See: Middlesex Superior Court Docket Number 06-4411. On February 9, 2003, Mrs. J. was found dead at the home of the defendant as a result of the negligence of the defendant. Her family retained the Burns & Jain. We probated her estate and filed suit for wrongful death against the defendants, who were medical professionals in a social setting, yet failed to come to the aid of Mrs. J., failed to call an ambulance for Mrs. J., and allowed her to die without medical attention when they knew she was ill.
As a result of the lawsuit, an award was made in the amount of $1,500,000.00 plus interest and costs. See: Essex Superior Court Civil Action Number 052227. "Highly experienced and professional and I would certainly engage him again." I was stressed out because I had upcoming court dates related to this and he took care of this and it was time sensitive as well. I highly recommend Roshan. The information on this website is for general information purposes only. Nothing on this website should be taken as legal advice for any individual case or situation. This information is not intended to create, and receipt or viewing does not constitute, an attorney-client relationship.